IS YOUR DISPLAY SPECTACULAR THIS SPRING? Kevin Croucher from Thornhayes Nursery in Cullompton is something of a legend when it comes to his horticultural knowledge. There’s a chance to hear him Kevin Croucher in action on Wednesday, 3rd April when he leads a walk and talk around the Devon nursery from 2pm to 4pm.He’ll lead the way around the arboretum and orchard and look at what is looking or smelling good at this time of the year. The walk is free. Kevin will also be leading tree walks daily at the Toby Buckland Garden Festival at Powderham Castle on Friday 3rd and Saturday, 4th May to look at the significant trees in the garden and the estate. www.tobygardenfest.co.uk Thornhayes Nursery, St Andrews Wood, Dulford, Cullompton, Devon EX15 2DF. Wool and Yarn Fest at RHS Rosemoor RHS Garden Rosemoor is staging its first Wool and Yarn Fest over the weekend of Saturday, 6th and Sunday, 7th April. The aim is to celebrate the ways wools and yarns can be used in our daily lives from creativity to practical use. There will be hands-on workshops, demonstrations and talks for spinning, weaving, needle felting, wet felting, Nuno felting and dyeing. A ‘yarn bomb’ is planned for the Winter Garden, so if there are any keen knitters or crocheters then RHS Rosemoor will be grateful for contributions. The festival runs from 10am to 5pm on Saturday and 10am to 4pm on Sunday. Normal garden entry for RHS members plus family guest. Non-members: adults £11.80; children (5-16) £5.90. RHS Garden Rosemoor, Great Torrington, Devon, EX38 8PH. LEGENDARY BLUEBELLS AT HARTLAND ABBEY The bluebells at Hartland Abbey are legendary and on Sunday, 14th April you can see them in all their glory as they carpet the woodland walks from the Walled Gardens to the sea at Blackpool Mill, the location for the BBC Television drama ‘The Night Manager’. There are lots of lovely walks through spring flowers, including camellias and wildflowers. There’s the added temptation of home cooked light lunches and cream teas. The historic, fascinating family house will be open. Dogs very welcome! From 11am to 5pm with reduced entry - adults £7, children £2. Hartland Abbey, Hartland, Nr Bideford, North Devon, EX17 4TU. Devon spring foraging days Spring foraging is hugely popular and there are a couple of special Devon days out coming up to enjoy the experience. Dartmoor Spring Foraging Course has two days on Friday, 12th April and Saturday, 13th April from 12 noon to 3.30pm. Dartmoor has plenty of wild food and clean growing environments for the freshest tasting plants found anywhere. The walk starts at Cleave, followed by a two and a half hour walk in the local area, around the woods fields and hedgerows. Adults: £50 under 16’s £25 The Cleave Inn, Lustleigh, Devon, Devon, TQ13 9TJ. Exeter Spring Foraging Course on Sunday ,14th April and Friday ,26th April is again a two and a half hour walk along the surrounding fields, hedgerows and canal, identifying the different edible and poisonous plants, flowers and hopefully mushrooms. Adults £45 under 16’s £22.50p The Double Locks, Canal Banks, Exeter, Devon, Exeter, Devon, EX2 6LT. RHS Rosemoor announces the busiest year ever RHS Rosemoor has announced its calendar of events for this year with the emphasis on the quality of its plants and planting. Thereâ&#x20AC;&#x2122;s also a strong commitment on what the RHS gardens offer to groups visiting the popular Devon garden from a wider area of the southwest. From flower shows and winter walks to rose festivals, artisan food fairs, specialist plant weekends and craft showcases, it is the busiest year yet for the gardens which sit in the Torridge Valley, between Exmoor and Dartmoor National Parks. Voted one of the best places in the country to see roses, and home to the only RHS Flower Show in the South West, it offers world-class horticulture. Visitors who are travelling as part of a group of ten â&#x20AC;&#x201C; whether this is friends, extended family or perhaps a gardening or allotment society â&#x20AC;&#x201C; can benefit from discounted group rates of ÂŁ7 per person as well as options for private tours or special catering packages. The highlights of events at RHS Garden Rosemoor over the next few weeks include: Saturday, 27th and Sunday, 28th April RHS NATIONAL RHODODENDRON SHOW Saturday, 4th, Sunday, 5th May and Monday 6th May: SPRING DESIGN FOR LIVING FAIR Showcasing a wealth of West Country creative talent. Saturday, 11th and Sunday,12th May PLANT HERITAGE SPRING FAIR About rare and disappearing plants from the worldâ&#x20AC;&#x2122;s leading cultivated plant conservation charity. Wednesday 29th May AN AFTERNOON WITH CHRIS BEARDSHAW A full list of events prices and opening times is available at www.rhs.org.uk RHS Garden Rosemoor, Torrington EX38 8PH. long-term health conditions and disabilities, Thrive is encouraging people who have never considered gardening to give it a go. Thrive chief executive Kathryn Rossiter said: “Whatever your circumstances, gardening can have a positive impact on your personal health and wellbeing. “Physically, it can improve mobility and strength, while mentally it can provide a sense of achievement and purpose.” The campaign will feature films and web content outlining each of the key benefits, featuring a number of Thrive Ambassadors, including ITV ‘s This Morning gardener David Domoney, BBC Gardeners’ World presenter Mark Lane and gardening blogger and vlogger Annabelle Padwick. Thrive, which works with clients aged from 14 to 87 at its centres, will also feature some of them explaining how they have benefited from gardening. It’s Not Just Gardening will help people give gardening a try by not only providing practical tips but also free seeds to kick-off straightforward growing projects that’ll work in anything from veg plots to window boxes. The show opens from 9am to 6pm THURSDAY, 9TH MAY: Adults: £36 online in advance, £40 on the day. Group tickets: £33 in advance, £40 on the day FRIDAY, 10TH MAY: Adults: £24 online in advance, £28 on the day. Group tickets: £33 in advance, £40 on the day SATURDAY, 11TH MAY: Adults: £21 online in advance, £25 on the day. Group tickets: £22 in advance, £25 on the day SUNDAY, 12TH MAY: Adults: £21 online in advance £25 on the day. Group tickets: £19 in advance, £25 on the day. Free parking at the showground indoor living. The rise in popularity of indoor growing comes after the hashtag #plantsofinstagram attracted millions of followers. In the house plants show, ten award winning nurseries will be exhibiting plants for indoor spaces – from trendy succulents and air plants to all colours of rainbow streptocarpus and luscious exotics foliage. Plans are also in the pipeline for Instagram-friendly points throughout the showground. With more than 37 per cent of the British population living in rented accommodation, the Green Living Spaces area is about bringing the outdoors in. For everything from patio to balcony gardening, the area demonstrates that having no garden at all is not an excuse to not grow plants, and how even a small windowsill can be the perfect growing spot. Advance tickets to RHS Malvern Spring Festival are now on sale. Children under 16 go free. with the pretty plant label and the carry tray it came home in. Steps are being made to solve this problem with designated drop off points for recycling. You can find your nearest one by searching www.recyclenow.com. Unfortunately they can often be miles away from where you live. A break through has recently come from a company called Aeroplas who have produced a range of taupe coloured pots which can included in household recycling. Taupe may not be the most striking colour but lets hope that this season taupe is the new black. Momentum for change is growing and conservation charities like the National Trust and the RHS are both launching initiatives, with the National Trust pledging to end most plastic products by 2022 and the RHS funding research into alternatives. Here are a few ways we can reduce the use of plastic in our own gardens. This is a good first step and one I am also adhering to on the nursery. If we all went out tomorrow and just simply got rid of our plastic we would just add to the waste problem. Instead if we can reuse the plastic we have it reduces the amount we need to buy in. Reusing plant pots and plant labels is a perfect example; a good wash and they can be used again and again. When these items need replacing we can then recycle them and purchase alternatives. One way of combating the collection of unwanted pots is to buy your plants bare root. Bare root plants are often field grown and require far less water then those in nursery pots resulting in strong plants with developed root systems. Some garden centres now offer a depotting service where you can leave the pot at the check out and have your plants wrapped in paper to take home. air root pruning. Pots are being developed using sustainable plant materials like bamboo fibre, rice husks and miscanthus grass. Vipot are a company who have been making plant fibre pots for some time now. They can last up to five years but will biodegrade in nine to 18 months if broken up and added to the compost heap. I recently trialled bamboo fibre pots and was surprised by just how heavy they are. Three times heavier in fact then the same size plastic pot which would take some lifting once full of compost and carried in trays. Individually though I think they look good enough to display in the home. It is also worth mentioning that plant fibre pots can become brittle as they age and often break if dropped. Coir and wood fibre pots biodegrade within 12 months and can be planted straight into the ground causing the plants little root disturbance. They are perfect for growing bedding, herbs and vegetable plants. For the first time I have also tried using seedling bags. They look like teabags and are a little tricky to fill with compost but take up less room then cell trays and are really affordable for growing on seedlings. Emma Robertson has 15 years horticultural experience and moved to Devon to manage the Formal and Woodland Garden at Knightshayes and was recently the National Trust head gardener at Castle Drogo, She is now setting up her own plant nursery, Tor Garden Plants in Brentor. As part of setting up the new plant nursery she is working towards it being plastic free which she is finding difficult but has been trialling different alternatives pots and labels. On the market is an array of wire grids, construct-it-yourself half-hoops on legs and ingenious spirals, a few of them aesthetically pleasing in their own right. They can all do a great job of supporting/encircling perennials if put in place at, crucially, the appropriate time (generally in early May) and equally crucially, at the right height to provide invisible support when the plants are in full flower and at their most vulnerable. It is also a case of “horses for courses” as most borders contain plants with varying growth and flower habits, so you need to build up a huge array of these metal stakes. On the face of it they seem like an extravagance, which is why so many gardeners fail to support their plants adequately. But most of them (particularly the now fashionable rusty metal supports) last for years and so can be viewed as an investment. Staking problems Prevent physical damage to plants during the staking process by inserting supports starting early in the season when the growth commences. Tying stems too tightly to the support can lead to stem damage. Secure growing stems regularly or add another tier of string or netting to prevent the plants outgrowing the support and subsequent damage. Your dream garden is just around the corner Think about it. What would your dream garden look like? a vegetable garden in which you can harvest your own fruit and vegetables? an ornamental garden with splendid flower beds that is a feast for the eyes? or maybe even both. Without the right equipment, soil preparation can be back-breaking but it doesn't have to be! With the right tools, you can quickly finish the digging chores and get to the parts you truly love. For more than 40 years, the Mantis Tiller has been Indispensable to gardeners for its efficiency, ease-of-use, power and durability. Whether you are a beginner or an experienced gardener, there is a Mantis tiller that is perfect for you. You will soon find it to be a most faithful helper in your garden. You’ll wonder how on earth you managed without it! It’s all well and good admiring from afar, but it’s only really with the selection, endeavour and refinement of growing your own tulips that they truly pull you under their spell. And for that we need to go a back a little, and that’s because the beginning of the cyclical calendar for tulips begins, for me and many others, in September or October, when the orders begin. Catalogues from growers working on that same hallowed ground as began the tulip boom - the fertile fields of the tulip nation, the Netherlands – spill over the table. Page after page after page of every colour in nature’s rainbow (except blue), pour out in a giddying riddle of variety. It’s this endless choice that leads to thoughtless gluttony and it takes practice to show reserve and constraint. I like to choose in threes – three sets of three different tulips, all in variation of the theme or colour I’ve chosen for the year. So, I might be inspired by the 17th century tastes and go for parrot or fringed shapes with strong ‘breaking’ (a disease that causes two colours to literally ‘break’ into one another) colour characteristics. Then you have continuity throughout the selection without the banality of choosing singular varieties. Some might caution against using many different varieties together because of the different flowering times, but I find this matters less than you think as it all comes together in the end. From the vibrant sharp green of emerging leaves to dazzling blossoms and bulbs, this is a magical time to get out and explore gardens that open their gates for charity. We’ve highlighted three great Devon gardens and then for those who want to travel out of the county there’s an even greater choice. We advise checking wherever possible before starting out on a journey as circumstances can force closures in private gardens (for gardens opening for the National Gardens Scheme, visit www.ngs.org.uk). Holne, Newton Abbot, Devon, TQ13 7SP A tranquil garden nestled in a Dartmoor valley, with babbling stream, swathes of colour and textual foliage., gentle paths and lawns bordered by spring flowering shrubs, herbaceous plants and ornamental grasses. Visit the artist’s studio. Open for the NGS on Good Friday 19th April, Saturday 20th, Easter Sunday 21st April and Easter Monday 22nd April, 1pm-5pm. Admission £4, children free. For more details contact Robbie & Sarah Richardson on 07725 314887 or email sarah@greatcombe.com. An edible garden of quarter of an acre backing onto The Byes Nature Reserve and River Sid; potagerstyle, with raised beds and an espalier fruit archway, designed for those with mobility problems; colour-themed herbaceous borders, perennials, herbs, ferns and hostas; a pond, rill, rockeries, greenhouse and a studio. Use of recycled material and a sculptured fountain. Open for the NGS on Saturday 20th to Easter Monday 22nd April, 1.30pm-5.30pm. Admission £4, children free. For more details contact Lynette Talbot & Peter Endersby on 01395 578081 or email latalbot01@gmail.com. MOORE BLATCH 48 High Street, Lymington, Hampshire, SO41 9ZQ Behind this elegant Georgian town house lies a surprising south-facing one-acre walled garden with a long vista across the croquet lawn to mature gardens beyond with glimpses of the Isle of Wight, amusing and varied topiary underplanted with mixed herbaceous, hellebores, tulips and forget-me-nots. Open for the NGS on Saturday 27th, 9.30am-1pm and Sunday 28th April, 2pm-5pm. Admission £3.50, children free. CHIDEOCK MANOR Chideock, Bridport, Dorset, DT6 6LF A large plantsman’s garden with magnificent views over the Dorset countryside towards the sea, many rare and mature plants and shrubs in terraced, herbaceous, rock and water gardens; woodland garden and walks in the bluebell woods, magnolia, rhododendron and bulbs. Open for the NGS on Wednesday 24th April, 11am-5pm. Admission £4.50, children free. For more details contact Mr & Mrs David Ashcroft on 01308 862212 or email angieashcroft@btinternet.com. A large plantsman’s garden with magnificent views over the Dorset countryside towards the sea, many rare and mature plants and shrubs in terraced, herbaceous, rock and water gardens; woodland garden and walks in the bluebell woods, magnolia, rhododendron and bulbs. Open for the NGS on Saturday 13th and Sunday 14th April, 2pm-5pm. Admission £6, children free. For more details contact Mr & Mrs Howard Coates on 07885 551795 or email deirdrecoates9@gmail.com. KNITSON OLD FARMHOUSE Corfe Castle, Wareham, Dorset, BH20 5JB A mature cottage garden nestled at the base of chalk downland with herbaceous borders, rockeries, climbers and shrubs, evolved and designed over 50 years for year-round colour and interest, and a large wildlifefriendly kitchen garden. Open for the NGS on Good Friday 19th April to Easter Monday 22nd April, 2pm-6pm. Admission £4, children free. For more details contact Rachel Helfer on 01929 421681 or email rjehelfer@gmail.com. JOB’S MILL Five Ash Lane, Crockerton, Warminster, Wiltshire, BA12 8BB A delightful five-acre garden through which the River Wylye flows, laid out on many levels surrounding an old converted water mill, with water garden, herbaceous border, vegetable garden, orchard, riverside and woodland walks and secret garden, and grass terraces designed by Russell Page. Spring bulbs and erythronium and perhaps the tallest growing wisteria? Open for the NGS on Saturday 13th April, 2pm5pm. Admission £4.50, children free. CARWINNICK Grampound, Truro, Cornwall, TR2 4RJ A new opening for the NGS, once a medieval farm, with much tree planting and development of the five acres which has borrowed the landscapes and vistas, so the woods at Heligan and turbines at Gorran can both be seen. A colourful spring garden with nearly 50 camellias, daffodils and other early shrubs and plants, and mainly semi-tropical plants around a tennis court. Open for the NGS on Sunday 14th April, 2pm-5pm. Admission £4.50, children free. You’ll find 50 acres of tranquil, family-owned Grade II listed gardens at Pencarrow, with specimen conifers, azaleas, magnolias, camellias and around 700 rhododendron varieties. Discover the Iron Age hill fort, lake, Italian gardens and granite rockery and children’s play area. Open for the NGS on Monday 8th April, 10am-5.30pm. Admission £6.50, children free. For more details contact the Molesworth-St Aubyn family on 01208 841369 or email info@pencarrow.co.uk, www.pencarrow.co.uk. CHYGURNO Lamorna, Cornwall, TR19 6XH A beautiful, three-acre cliffside garden overlooking Lamorna Cove, with mainly southern hemisphere shrubs and exotics with hydrangeas, camellias and rhododendrons; woodland area with tree ferns set against large granite outcrops, the garden terraced with steep steps and paths. Plenty of benches to enjoy the wonderful views. Open for the NGS on Saturday 27th and Sunday 28th April, 2pm-5pm. Admission £5, children free. For more details contact Dr & Mrs Robert Moule on 01736 732153 or email rmoule010@btinternet.com. more info on home composting and food waste collections. out any time from late autumn to early spring. As with all our native plants, common hedge species have unique relationships with native fauna. When they think about the food that they provide most people think about the berries for birds and small mammals – and larger mammals like gardeners! There’s a largely unnoticed community of animals further down the food chain, however, which depends on a hedge for other forms of sustenance. Frosts are an enemy of the immature hedge. If there are heavy frosts after planting, the soil can break up, so the plants may need to be firmed in again. Severe frosts will cause damage to leaves – generally they will recover but weather damage is always a risk you need to be aware of, particularly with new plants. In windy sites, the wind can ‘rock’ new plants opening up air pockets where either frost can get in or roots can be exposed to drying winds. Firm in the plants from time to time. Ideally evergreens need to be sheltered from drying winds during their first winter and growing season. If the weather is particularly severe or the site is subject to strong winds, it would be sensible to put up some windbreak netting to help prevent the plants drying out before their roots are established. Hedge plants are planted close together so there is competition between the roots for nutrients and the trimming of hedges clips away much of the plant’s foodproducing unit so an annual mulch of well rotted manure or compost or any annual feed of a foliar fertiliser is helpful to maintain vigour. Hawthorn varieties Crataegus laevigata Paul’s Scarlet is a small, rounded tree covered in showy, light red double flowers. Crataegus laevigata Rosea Flore Pleno is a small, rounded tree with pink double flowers. Crataegus monogyna is the common hawthorn. It is a rounded tree with masses of cream flowers, followed by dark red berries in autumn. It can also be used as a hedging plant. Crataegus persimilis Prunifolia forms a small, broad tree with white flowers, deep red berries and fabulous fiery red and orange autumn foliage. The lengthening days make this the perfect time to set up the garden for the rest of the summer. Here’s what now might need doing in the garden. Bed of roses Foliage-feed the first new growth on the roses and continue to do so every three to four weeks to avoid the use of toxic rose sprays. An organic tonic is the best option for this time of the year which will help to ward off blackspot and mildew which will be lying dormant and ready to pounce. A handful of slow-release organic blood, fish and bone spread evenly about the roots will set up the health of your plants. this prevents them from rotting and it’s also a great slug repellent. Backfill with soil and add a ring of sand to mark the planting spot. It’s also another useful means of combating those pesky slugs and snails. Write labels for each dahlia cultivar and place them correctly next to each plant; a foolproof way to remember what you’ve planted in a few months’ time. TOUGHEN UP GREENHOUSE PLANTS Start hardening off greenhouse grown plants to give them a chance to toughen up and make them better able to withstand pests and weather. Choose a clement day to begin and start by putting them outside, out of cold winds, strong rain or sun and somewhere out of reach of marauding slugs. Allow a week or two before planting out, once all chance of frost has passed. Sow seeds of sweet peas into deep pots or roottrainers as they dislike disturbance to their roots. Sweet peas will sprout in 21 to 30 days if the soil temperature is 38° Fahrenheit (3.3° celsius) and the germination rate, or number of seeds that do sprout, will be low. Or, instead, look out for young plants in nurseries and garden centres. Check whether they are grown for scent or for cutting. Some longer stemmed varieties may smell less strongly. Cut off any frost damaged leaves or tips from flowering shrubs to prevent further die back. For a quick turnaround, why not start a no-dig bed. Lay thick cardboard over the ground and top it with a thick mixture of topsoil and compost, which you can plant into straight away. The popular No Dig method of cultivation can be used for two purposes: to provide a rich soil to grow in, and to clear a weedinfested growing area. Both instances require a great deal of surface mulch (well-rotted manure or compost). In principle, by avoiding digging you will not be disrupting the soil life, nor will you be exposing the soil to weed seeds. Instead the existing weeds are in darkness, which causes them to weaken and die. It’s potato planting time Potatoes need to be planted this month. As a rule new potatoes go in early to mid April. Maincrops follow in the second half of the month but exactly when you plant your potatoes will depend on the conditions in your area. You want to avoid the emerging foliage being burned by frost. Plant somewhere sunny into a six-inch deep trench lined with garden compost. New potatoes (also known as First and Second Earlies) should be spaced a foot apart. Leave 15 inches between maincrop tubers. HERBAL P OWER Time for TLC for your lawn This is the perfect time to give your lawn a bit of care and attention. First rake off loose thatch and moss. This enables the grass to grow healthily during the season. Next, either using a proprietary aerator attachment, or a garden fork make holes across the lawn to help aerate the soil and prevent compaction. If you’re using a fork dig to a depth of about three to four inches and wiggle the tines to remove. Sprinkling sand into the holes also helps. Once you have removed the weeds and moss to your liking topdress the lawn with a feed and conditioner. If there are any bald patches you can resow these now. Small patches can be targeted with special feed and seed mixtures. You can buy mixes designed for high use areas and for shaded areas. Some mixes even contain neutralisers to prevent pet urine marks. Tidy the edges of the lawn where they meet flower borders. First mark a straight line using string held taught between two posts. Using a half moon lawn edger, follow the string, cutting away ragged edges and throw these away. This isn’t just a job for houseproud gardeners. Cutting the grass away prevents weeds and grasses growing into flowerbeds. Plant herbs like rosemary, thyme and oregano. Any that have become leggy can be trimmed to suit the space. You can cut rosemary into the wood if it has become wild and straggly. If you grow on clay or badly draining soil it’s a good idea to put some grit in the base of the planting hole to help with drainage. OTHER JOBS • Start staking delphiniums and tall perennials. They’ll soon be tall enough to be knocked over by wind or heavy rain. If you can get your hands on some hazel or silver birch pea sticks, use them to weave a basket, which works just as well but looks so much nicer than metal or plastic. • Plant up hanging baskets and containers. Keep them under cover to grow on until the frosts have passed. Go for something exceptionally long-flowering such as Argyranthemum ‘Cherry Red’ or Verbena ‘Homestead Purple’. • Keep an eye on permanent or spring plantings in containers and water if necessary. • Feed lawns and treat for moss. Try to work out the reason for the moss. Is the grass too shady, or the soil too acid or compacted? Aim to sort the problem out now for a lovely lawn all summer. Thornhayes Nursery offers personal service of the highest quality As a specialist nursery with many years’ experience growing a wide range of select trees and shrubs, Thornhayes Nursery just outside of Cullompton is always happy to offer free advice if you visit their nursery. It is important to select the right plant for your chosen planting spot. As a further service to customers, owner and expert grower Kevin Croucher can provide a bespoke advice service by visiting your garden and offering his personal planting views. With over 40 years’ experience working with woody plants Kevin will make sure you don’t make misjudgements in your planting selection. www.thornhayes-nursery.co.uk Thornhayes Nursery, Dulford, Cullompton, Devon EX15 2DF. Tel: 01884 266746.
elsewhere – be they pelargoniums, alpines or ferns, roses or camellias – and the advice you’ll get is first hand and reliable. They also offer great value and you can share the passion they have for the plants they grow. Support them whenever you can – they are usually run by individuals who don’t make a vast profit and who do the job for love as much as anything else. They should be your first port of call. They are nurserymen, many specialising in either a specific varieties or ranges of plants and their knowledge is second to none. So as spring starts to change gear we’re delighted to offer you some options of where to buy that something special. Order your plants now for delivery in May. ORDER ONLINE or catalogue available by request. Open for the National Garden Scheme Step out in Style? Lightweight, waterproof, durable outdoor/garden clogs featuring unique prints. Sizes range from UK 3-14 with prices starting from £22 including free standard postage. There is something suitable for everyone from our entire collection, Garden Clogs, Chelsea Boots, Storage Bags or Flip Flops! Artist blacksmith specialising in garden supports, art, structures and furniture. Commissions welcomed. JAPANESE MAPLES Acer palmatum varieties We produce and grow the largest selection available in the UK. Plants are pot grown and suitable for garden, patio or bonsai. Many vegetables that we grow and cook taste as good, if not better, eaten raw and are generally more nutritious. It just needs a little imagination. The ever increasing number of gardeners who grow their own vegetables have the luxury of being able to eat crops at their finest –just minutes after being picked. It seems a shame then to boil, steam or roast what is often wonderfully sweet and tender vegetables without any cooking. Eating raw vegetable not only introduces different flavours and textures to meals but also as extra nutrients. The high levels of vitamins, minerals, antioxidants that occur in vegetables are known to decrease with cooking so it is a good idea to include something raw in your daily intake of vegetables. This is more than just including lettuce leaves. So many crops taste delicious without cooking especially if they are harvested when young, sugary and succulent. They are also quick to prepare- the ultimate fast food. Even peeling can be avoided whenever possible as the highest concentration of nutrients are often found just beneath the skins. ‘Eating raw vegetables introduces different f lavours and textures to meals’ It is true raw foods take more effort to digest. It is possible that when you are eating salads or raw vegetables, you are simply eating a larger volume of produce. It is also possible that it isn’t the ‘raw’ element that is the problem, but rather which vegetables you are choosing. So what are the options from the vegetable plot? Many familiar vegetables taste quite different uncooked and those rushed straight to the table from the garden are always far superior to anything which comes from the shop shelf. Thinning’s from rows of carrots and beetroot are a great early source of baby roots and make a colourful addition to a salad bowl, either grated or sliced. For sweet early carrots to eat raw select cultivars such as ‘Amsterdam Forcing ‘Imperator’ or ‘Samurai’. French beans, both climbing and dwarf varieties have a crisp flavour when eaten raw. Easy to grow chard with vibrant stems and beetroot like flavour is delicious harvested as baby leaves for salads and sandwiches. Try slow to bolt ‘ Charlotte’ for really colourful leaves or ‘ Bright Yellow’ for stems which are exactly that. Brassicas should not be overlooked as vegetables to eat raw. The striking, spiky florets of cauliflower ‘Romanesco’ can be harvested from late summer and make delicious crudités. Of all the cruciferous vegetables, broccoli has the highest level of carotenoids, which may reduce the risk of renal cancer and lung cancer and can be an unusual addition to salads when picked young. Cabbage leaves can provide a crunchy peppery flavour in winter salads. In addition to its possible cancer-fighting properties, cabbage is an excellent source of vitamins C and K, containing more than 20 per cent of the daily value for each per serving. Cabbage has also been used throughout history as an herbal remedy. The Greek used it as a laxative, while ancient Roman nobleman Pliny the Elder recommended eating cabbage to cure hangovers. Asparagus are one of the most desirable vegetables and harvested young the first tender spears are a delectable raw treat which means the rest of the crop can be left to mature as normal. Watercress is one of the oldest known leaf vegetables eaten by humans. In addition to its anti-carcinogenic properties, watercress has significant amounts of calcium, folic acid, iodine, iron, manganese and vitamins A, B6, C and K. It is also effective as a diuretic, expectorant and digestive aid. So it just needs a little imagination and the pleasure of easting these vegetables raw may be easier to accept than you think. healthy condiment with a distinctive sour flavour. It is very simple to make and needs little specialist equipment making it the ideal first fermentation project. Fermentation may be very in vogue but it is a method that has been used for thousands of years as a way of preserving produce, especially through the winter months when little fresh produce was available. Every culture around the world has its own fermenting tradition: in Japan it is miso, in Korea it is kimchi, in Latin America it is cortido and in Germany and Central Europe it is sauerkraut and other fermented vegetables. Although still used as a winter standby it is now also eaten for its welldocumented health benefits. During the fermentation process beneficial bacteria – probiotics – are produced. Probiotics help our digestive system work at its optimum. Most of our immune system is in our gut so these probiotics increase our immunity by keeping the gut healthy. Research also shows that eating fermented foods can help with digestive issues, increase our absorption of nutrients and contribute to our overall long-term health, possibly even reducing the risk of illnesses like Alzheimer’s, cancer and depression. Although sauerkraut can be added to soups and stews it is best eaten raw as heat reduces its health benefits. When salt is added to cabbage and bottled, it undergoes a process call lacto-acid fermentation. Beneficial bacteria is present on the surface of the cabbage. When put in an anaerobic (oxygen-free) environment these bacteria convert sugars into lactic acid which gets rid of bad bacteria, works as a preservative and gives the finished sauerkraut its distinctive sour taste. • In a salad • In a sandwich • As an accompaniment to sausages • As a side to smoked meat or fish • On toast with avocado • Added to soups/stews (although heat reduces its health benefits) • With a lentil casserole • Straight out of the jar! the Americans over a tree! Path Patio & Decking Cleaner Helps restore the natural colour of virtually any outdoor surface the organic way. No scrubbing or rinsing required, simply apply and walk away. Use Algon to clean patios, driveways, decking, wood, polytunnels, garden furniture and much more! Sat 30th & Sun 31st March • Sat 27th & Sun 28th April • Sat 1st & Sun 2nd June Come and join us on our nursery and take the chance to rummage around in the best selection of Heucheras in the Kingdom. All the latest varieties and trusty old favourites. Top tips on getting the most out of your plants. way through rough lumpy soil. Give them a fine, free-flowing compost that drains well and they will repay you with healthy, rapid growth. A general rule is to plant the seed to twice its depth, so a seed that is .5cm should be planted 1cm deep. Sprinkle very tiny seeds on the surface of the soil and gently press them in to ensure that they are firmly in contact with the soil. Flat seeds should be planted on their sides so that water doesn’t sit on the flat surface and rot the seed before it has a chance to germinate. To avoid flooding your delicate seeds, convert an old plastic water bottle into a seed sprinkler by poking some fine holes into the lid. Cover the pot with a plastic bag held away from the soil with lolly sticks or wire. This will provide a healthy, consistent environment at the surface of the soil. A heated propagator is a very useful device now that most of us no longer have airing cupboards that used to offer a constant moderate heat which was ideal for germinating seedlings. Once the tiny plants emerge from the soil remove the cover so that air can circulate. Keep the soil just moist and make sure your tiny plants aren’t exposed to drafts or harsh sunlight. You can grow whole gardens from seed in just one season. Fancy a complete herb garden that you have grown yourself? Basil, thyme, mint, chives, coriander, dill, anise, lemon balm, Mexican tarragon, borage, parsley and many other herbs are all dead-easy and very inexpensive to grow from seed. Many perennials will flower the very first season from a spring sowing. Imagine a whole perennial garden grown for the cost of a few packets of seeds. Start them off indoors in early spring, feed them well and carefully harden them off. Some of the very best first year flowering perennials are oriental poppies, lupins, foxgloves (go for ‘Foxy’), salvias, bergamont, rudbeckia, penstemon, gaillardia, sedums, mallow, echinacea, verbena, agastache and delphinium among very many others. Great Places TO VISIT April is a magical time of year and offers something unique when it comes to days out There’s a freshness and special vibrancy to all the gardens which only early spring brings. And it’s all the more enjoyable to get out and about enjoying gardens after the long winter months. So, whether it’s a case of travelling to one of the fantastic range of great gardens which are now open for the new season, visiting nurseries, enjoying a break away, dropping in on a plant fair or any other gardening day out, you’ll love our selection of places and events to visit that will guarantee that great day out. Lukesland Gardens, Ivybridge, ‘One of the finest gardens of its kind’ ‘What a glorious, tranquil place – divine plants’ ‘Enchanting garden and a lovely cup of tea!’- comments from appreciative visitors to the spectacular 24-acre Lukesland Gardens in Ivybridge. Tucked away in a woodland valley on the edge of Dartmoor Lukesland’s collection of camellias, rhododendrons and azaleas provides a spectacular show of colour in the spring. With home-made soup and cakes served up by the family in the Victorian Billiard Tea Room and a children’s trail these gardens have something for everyone. Dogs are welcome on a lead. The gardens are open for spring colour from 11am to 5pm on Sundays, Wednesdays and Bank Holidays (31st March – 16th June ). For further details call 01752 691749 or go to www.lukesland.co.uk Lukesland Gardens, Lukesland House, Hartford, Ivybridge PL21 0JF. For spectacular spring walks... Wander through clouds of confetti-like blossom at beautiful Batsford Arboretum. Enjoy fabulous food and a wonderful selection of gifts and gardening goodies and plants. A perfect day out for all the family - dog friendly too! Rare Plant Fairs in April The 25th anniversary season of the popular Rare Plant Fairs continues in April with two events. The first is set in the 60-acre woodland gardens at Evenley Wood, near Brackley in Northamptonshire, on Sunday, 7th April, followed by a long-standing event at The Old Rectory at Quenington, near Cirencester, on Sunday, 14th April, in support of Cobalt Health. Both fairs run from 11am-4pm. There is a great selection of specialist nurseries attending both fairs, including a number of National Collection holders. There will be a wide range of interesting and unusual plants for sale, including choice perennials; plants for shade; rare climbers; alpines; herbs and edibles; and a selection of unusual shrubs. There are 13 Rare Plant in 2019. Visit www.rareplantfair.co.uk for details of all the events, including lists of the exhibitors attending. The Old Rectory, Quenington, Nr. Cirencester, GL7 5BN www.rareplantfair.co.uk Please visit our website for full details of admission fees and times of opening. Annual Sculpture Exhibition 18 May to 31 October Beautiful woodland and water gardens world-famous for a National Collection of Birch and Alder. Gardens open 10am - 6pm (dusk in winter) every day all year round. Entry £6. ‘Friends’ membership available. Just 2 miles from the A30 Whiddon Down. Counting down to the NEW LOOK Powderham garden festival The sixth Toby Buckland Garden Festival takes place in the stunning surroundings of Powderham Castle and a has a new look and a host of added attractions The countdown continues to the Toby Buckland Garden Festival at Powderham Castle near Exeter on Friday, May 3rd and Saturday, May 4th –an event now in its sixth year and one of the highlights in the southwest gardening calendar. There’s a new layout for the festival to the front of the castle, with more under-cover space in the shape of an Artisan Barn and theatre and a new Country Gardener Magazine Talks Tent. And for the first time the festival now welcomes dogs This year the festival will be divided into zones, including the Gardening Village, Feast street and Craft Zone to help visitors more easily find what they are looking for. The list of nurseries includes award winning Chelsea stalwarts and some exceptional new growers. PLANTS AND MORE PLANTS! More than 30 nurseries will be at the festival with flowers, fruit, veg and trees, including award-winning RHS medal winners. Floyds Climbers known for their fabulous range of clematis and Avon Bulbs with owner Christopher Ireland-Jones and Dawlish nursery Whetmans with their range of long-flowering, scented pinks. New for 2019 are Andy’s Air Plants with their curious indoor greenery, which like hanging sculpture grow without soil, and Burnham Orchids famous for their beautiful conservatory and house plant orchids. Powderham Castle’s impressive Dining Hall will for the first time host celebrity speakers. Garden designer Joe Swift of BBC Gardeners’ World on Friday 3rd and Frances Tophill Frances Tophill, of Gardener’s World and ITV’s Love Your Garden will be sharing wisdom on growing the right plant in the right place on Saturday 4th May. PLUS • BBC Radio Devon are broadcasting live and recording the Gardeners’ Q&A each afternoon. • The festival hosts a special Garden Advice Clinic where you can sort out pest problems with help from Grazers – who make planet-friendly pest deterrents – and top bug expert, Dr Ian Bedford of the John Innes Research Centre. Stephanie Hafferty, no dig gardener and author of The Creative Kitchen and co-writer with Charles Dowding of the award-winning No Dig Organic Home and Gardener, is speaking on no dig gardening at the festival Stephanie Hafferty on Friday, 3rd May – free to visitors. What is no dig gardening? It’s a method that’s been around for centuries of not turning over the soil. Instead of digging over the ground every winter as we were taught to do, you mulch the ground once a year with about an inch of composted mulch. It saves a huge amount of time and it’s good if you have a bad back! When you turn over the soil, it exposes the weed seed, so not digging means there are significantly fewer annual weeds and it preserves the soil life, the worms and the fungi. all, or if you do, it will be granted as a matter of course. Wrong again! It is true that in most cases (excepting relevant neighbour issues) and where a special planning status is not applicable, you will probably have a reasonably easy journey. Unfortunately, most of us live in homes in close proximity to our neighbours, or that either have some architectural merit or are located in areas of a particular planning status. In these instances, it is often where the difficulties start. Frequently, you will see notices displayed near a house or site on which a recent planning application has been made. In some instances you will need to advertise your proposal in the local paper. These arrangements are designed to alert local people to your proposal and to allow them the opportunity of making representations – good, bad or indifferent. Indeed, anyone can comment on your proposal, whether or not they are qualified so to do or not. And often they are not! So with rules, regulations, neighbours and random (seldom supportive) comments lodged with your council, this journey is looking far from easy. To be successful you are likely to require the services of a specialist. What specialist then, and where do I find one? Actually, this is not as difficult as you might imagine. The planning officer dealing with your application will more than likely be a chartered member of The Royal Town Planning Institute (RTPI). If you want an equally qualified opinion in your corner it makes obvious sense to consult with an RTPI member who operates in the private sector. He/ she will naturally speak the planning language I mentioned earlier. They will also be able to study the local plan applicable to your area, and to advise you on the compliance, or otherwise, of your proposal. The RTPI will happily supply you with a list of their members local to you. The best advice never comes cheap, so I suggest you get quotes from three outfits before you decide. The planning system with all its faults is by and large an exceptional success for all us living in Britain today. We rather take it for granted, and moan about its deficiencies We don’t want urban sprawl despoiling unique countryside, but we want the right to improve our homes and gardens within the legal requirements, and we don’t want unnecessary stress doing it! 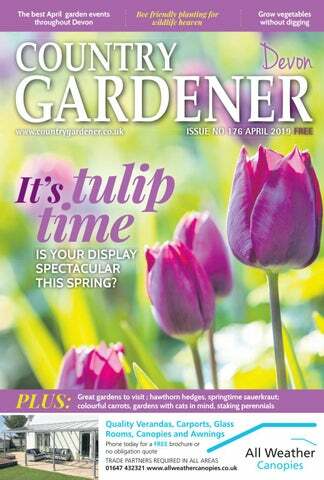 NEXT ISSUE: Some of the issues of how your garden can be affected. The Country Gardener postbag continues to fill up with queries from readers on a wide variety of gardening problems. Here’s a spring themed selection. We have just planted some new fruit trees - apples and pears - in a small field off our main garden in a quite exposed position. Is frost damage likely to affect them and limit the crop? Most top fruit and soft fruit are very hardy but once they start into growth in spring, flowers and buds are especially vulnerable to frost and may need protection to crop well. Most potential fruit damage can be avoided by choosing a site where spring frosts are least likely. If this is not possible to avoid frost pockets consider protecting them with the following methods: SOFT FRUIT BUSHES: use fleece to cover and protect the flowers and developing crop on nights when frost is forecast. STRAWBERRIES: protect with cloches or a double layer of fleece, removing or opening both in the day to allow pollinators access. SMALL YOUNG FRUIT TREES: cover with fleece overnight to provide frost protection and remove during the day, but this is generally impractical with larger trees. FRUIT GROWN ON WALLS AND FENCES (CORDON, ESPALIER OR FAN-TRAINED): cover with two or three layers of horticultural fleece, hessian or shade netting. This should be rolled up during the day. Use canes to keep the material off the blossoms. Remove the covers as soon as the danger is over. Can I grow herbs all year round in a sheltered but cool courtyard which doesn’t get a lot of sun? You will have to be selective in what you grow. Most herbs in containers will flourish for eight or nine months in the year. The downside is that many pot-grown herbs die out in winter. However, they can be harvested in autumn and stored for use throughout the winter season. The trick may be to vary where the herbs are grown. Sow tender herb seeds such as basil, marjoram, coriander, and tender perennials such as French tarragon indoors in spring for planting outdoors after all risk of frost passes. Some herbs can live outside all year once they are established. Try mint, oregano, rosemary, thyme and sage. These can be sown indoors as with the tender herbs, or sow them outdoors in May in containers. Delay buying herb plants from garden centres until the weather warms up in late spring. Winter planted herbs are vulnerable to root damage in the cold wet potting media. Some herbs die back in winter, for example French tarragon and mint. These and most herbs will look after themselves if placed where they cannot be frozen, saturated by rain or allowed to become too dry. Suitable places include in the rain shadow of walls, in a coldframe or even in an open fronted shed. A sheet of glass or plywood can keep off heavy rain in wet regions. Use pot feet or stand containers on bricks to avoid waterlogging. If very cold weather is forecast, protect containers from freezing by wrapping in bubble polythene. of the young plants once they reach about a foot high – new branches will sprout further down the stem to produce a more balanced and sturdy plant. Feed peppers when they come into flower with a high potash feed, such as tomato fertiliser and for plants in greenhouses, you could raise humidity levels by spraying plants with water or damping down greenhouse paths. This will help the flowers to set fruit. Once they are fruiting, pick them as soon as they are ready to encourage more flowers and fruits to follow. Though they’re fairly disease tolerant, there are a few common tulip diseases that can affect the soil or tulip bulbs. One common tulip fungal disease is the Botrytis blight, also known as tulip fire or mycelial neck rot. This problem affects every part of the tulip and it looks as if this may be your problem. It appears as discoloured, singed-looking spots on the leaves and petals. The stems may become weak and collapse, while the bulbs become covered with lesions. Tulip disease problems are often treated by a thorough examination before planting. Study each bulb carefully, looking for tell-tale dark or spongy spots and mould. You can also detect rot by dropping the bulbs in water: rotten bulbs will float, while healthy bulbs will sink. Unfortunately, water is a good carrier of disease. This makes it easier for infected bulbs to spread to healthy ones. It may be a little early to give up on your bulbs. Be sure to spray all the good bulbs with fungicide to prevent future issues. If any of these tulip disease problems manifest themselves on your tulip plants, remove and burn the infected plants as soon as you notice them. Don’t plant tulips in that spot for a few years, as the disease spores can remain in the soil and infect future plants. If you have a gardening question which is causing you problems then write to us at: Country Gardener, Mount House, Halse, Taunton, Somerset TA4 3AD and we will try and include it in this regular advice feature. HUGE RANGE OF SEED POTATOES, VEGETABLE SEEDS AND A GREATLY EXPANDED RANGE OF FLOWER SEEDS Huge selection of Pet Food and accessories Wonderful Saddlery department Country and Workwear clothing Most things for your Garden Feed for Cattle, Sheep, Horses, Alpacas and Chickens etc Grass Seeds from field to garden Log stores, sheds, poultry houses, field shelters and stables, Gates, stakes, stockfence and fittings And much more! Gardens can provide a sensory experience for your feline friend, as well as a safe space for them to exercise or hide away. By taking a few extra precautions, you could also protect other wildlife that visits your garden, or keep a section of your garden cat-free to grow your favourite plants. Now is the perfect time to get out in the garden, preparing for the warmer months ahead. But if you have a cat how much thought do you give to the impact it has on your garden and have you thought about designing your garden around your cat? It might not be quite what you had in mind to give the garden some specific cat attention but it can result in a happier puss, which makes for happier owners and even happier neighbours! Being free-roaming creatures, you can take a cat out of the outdoors but you can’t always take the outdoors out of the cat - scaling fences, pouncing from bushes and creeping through the undergrowth all come naturally. So why not nurture their need for exploration by creating a cat-friendly garden? Not only will this make your outdoor cat less likely to venture on to a nearby road in search of new adventures, but it might stop him squatting in the neighbours’ gardens too! Like most wildlife, cats much prefer a garden that is a bit rough at the edges to one that is maintained in immaculate order. GO ORGANIC Non-organic chemicals present in weedkillers and slug pellets can be harmful to your cat if they eat or come into contact with an infected plant or creature. If you do use non-organic chemicals, always follow the instructions on the packaging, and keep them locked away in a shed or garage. PLANTS THEY’LL LOVE The nepetalactone present in some nepeta (catmint) species has a natural, non-toxic euphoric effect on some cats, particularly Nepeta cataria (catnip). Valeriana officinalis (common valerian) is another favourite, which can create a similar effect to catmint due to naturally-occurring actinidine. Some cats will also enjoy chewing and nibbling on Dactylis glomerata (cat grass). There are several grasses that cats can snack on, but this is the most widely available as seed or, increasingly, sprouting in pots. CREATE A NO-GO ZONE If you want to keep a particular section of your garden away from prowling paws, try incorporating plants with repellant smells such as Plectranthus caninus (also known as Coleus canina or ‘scaredy cat’ plant), or aromatic herbs like lavender, rosemary or Helichrysum italicum (curry plant), which some cats dislike and may avoid. Cats can feel threatened in exposed spaces and love secluded spots where they can rest and keep on eye on what’s happening! Choose bushy plants without thorns which can provide shade and a secluded spot for cats to enjoy – lavender is a great choice. Remember the great outdoors can pose some risks to cats. Avoid plants which can be toxic to cats – lilies in particular can be lethal. A full list is available on Cats Protection’s website at www.cats.org.uk/dangerous-plants. PLANTS TO AVOID Most cats are fastidious creatures and are careful about what they eat. Poisoning in cats is therefore generally rare. It is the young inquisitive cat or kitten that is most at risk of eating harmful plants, particularly household ones. However lilies are toxic and potentially fatal to cats, so should be avoided completely. Alliums, amaryllis, crocuses, daffodils, hyacinths and tulips can be dangerous to cats, as can cyclamen, poinsettias and rhododendrons. Crocosmias have specialised roots on the bottom corm which haul the plant back down to where it belongs. utilised by man. The vivid yellow of the berberis root has been used as a dye as well as an ingredient in homeopathic medicine. Turmeric, ginger and galangal have all been proven to impart extensive health benefits alongside their culinary value. The delicately flowered bloodroot, Sanguinaria Canadensis, was used as a rich red dye by First Nation Americans, as well as a medicine for both cleansing and lung problems. There is a darker side. One that Harry Potter fans will be familiar with. The mandrake. The roots of these plants have long been associated with folklore and witchcraft. The roots supposedly scream when they are wrenched from the ground, the sound of which is fatal. Having never tried this frankly risky exercise, I am not in a position to comment. However to be quite sure I would err on the side of caution. As gardeners we rarely see the roots of plants, unless we are about to eat them or are transplanting, but this is short sighted. If things are not ideal below the ground, it will be apparent above. Too wet, too dry, restricted or starved it will soon become obvious. Without an extensive and healthy root system our plants will become sickly. We would do well to look after our underground friends and their subterranean world. It is upon them that the stems will grow strong. BREXIT VEGETABLE GROWING SURVIVAL KIT 12 essential container varieties for continuous cropping through the year to help feed your family, with full instructions and sowing / harvesting plan inside. Aimed at either the absolute 41 beginner or allotmenteer £7g.ular and makes a great E e r V SAoff theprice. gift. DORSET WATER LILY COMPANY The Uk’s largest selection of established pot grown water lilies for public and landscape supply. Speciality hardy marginals and moisture loving bogside. Forton Nursery Top quality Perennials, Shrubs and Trees. Located in Forton village, near Chard TA20 4HD Tel 01460 239569 fortonnursery@btconnect.com Closed Tuesdays and Wednesdays. Welcome to the NEW GENERATION lawn mowers There’s a new generation of lawn mowers on the market - relying on clean and safe battery power. They are expensive but John Swithinbank is impressed with their performance Technology can be frustrating on frequent occasions. From those inevitable non-fathomable computer glitches to contracting that horrible condition called FOBO (Fear of Being Offline) when our routers fail at a crucial time just to annoy us! However, sometimes technology makes for a better life - enter the era of the modern lawnmower with no smelly petrol engine or trailing electric cable waiting to be severed to clout us with a hair raising electric shock! I’m talking about the new generation of rechargeable battery powered lawnmowers. We are now well into spring and you might be one of the unfortunate gardeners finding that your lawnmower which you used last year is no longer fit for purpose. To help out, I’m looking at five battery mowers all of which are worthy contenders for the new mowing season. For the best deals shop around online but just make sure that the price includes charger and battery as these are expensive. Prices seem to vary day to day so that’s why I’ve not included them here. For more detailed technical specifications there’s also lots of info. on line. Bear in mind that longer grass, wet grass and coarser grass lawns may reduce the efficiency and battery running times of these mowers. Also, bear in mind that these mowers are either pushed along by yourself or they power themselves along as well. This is a particularly useful feature on the larger heavier machines but hand pushed is sometimes easier around tight obstacles. One last thing to look out for is the minimum and maximum height of cut to make sure it will cut to a height of your liking. Stihl RMA 235 A cheeky little number by way of its ability to adjust the blade speed depending on grass conditions hence saving on battery drainage. It’s a great model for smaller lawns and, like the Flymo, quite light although a tad heavier than its rival. I found its quality of the cut unrivalled. If there’s a gripe, then it’s the rather long time it takes for the battery to recharge (a faster charger is available at extra cost) but hey, we are talking here of a sophisticated battery management system when put to the sward. Bosch Rotak 43 Li-2 Ergoflex With a minimum height of cut of 20mm this mower is one for the lawn lover who likes a close shave and those Centre Court stripes. Its only downfall is that its not self propelled but it is light enough to push around a medium sized lawn. It’s great that it comes with a spare battery as charge time is about one and a half hours. I couldn’t fault its performance. Flymo Mighti-Mo 300 Li Cordless Battery Lawn Mower Not built for large lawns this push along mower will appeal to those with small lawns. Don’t get me wrong, it’s powerful enough to cope with challenging conditions but due to it’s narrow width of cutting (30cm) and a relatively small grass box don’t expect it to chomp through vast swards of our green and pleasant land. One great advantage it’s got over some other mowers is it’s lightness and won’t take up much storage room. So, if it takes less than half an hour to mow your lawn this mower may be worth considering. Hyundai HYM120LI510 120V Yes, believe it of not Hyundai don’t just make cars. This powerful mower can run up to one hour on a single charge and comes with two batteries and a wide 510mm cutting width to cope with larger lawns. It does however take about an hour or so to charge one battery but this isn’t a great problem with another battery waiting in the wings. Not only has it got a fairly large grass box to collect the cut grass but it is capable of discharging from the rear without the box or to one side if preferred. It can also mulch the clippings to feed the lawn naturally but over time this could lead to a build up of thatch requiring scarification. Ego LM2014E-SP 50cm Self-Propelled This is a big-boy suited to larger lawns and it can collect, mulch and side discharge the clippings. I found that it had enough clout to rival the best petrol mowers but beware that if you are mowing hard over about half an hour or so the battery could be ready for another charge which takes about 35 - 40 minutes - time enough for feet up and a long tea break. Here’s a selection of gardening events to look out for during the next few weeks throughout Devon. Send us details of your event at least ten weeks before publication and we will publicise it free of charge. Make sure you let us know where the event is being held, the date and include a contact telephone number. We are keen to support garden club events and we will be glad to publicise talks and shows held during the year where clubs want to attract a wider audience, but we do not have space for club outings or parties. We suggest that garden clubs send us their diary for the year for events to be included in the relevant issue of the magazine. Please send to Country Gardener Magazines, Mount House, Halse, Taunton TA4 3AD or by email to timeoff@countrygardener.co.uk We take great care to ensure that details are correct at the time of going to press but we advise readers to check wherever possible before starting out on a journey as circumstances can force last minute changes. All NGS open gardens can be found on www.ngs.org.uk or in the local NGS booklet available at many outlets. fork or take on all manner of weird and wonderful shapes. Sow seeds into well-prepared soil that has been raked to a fine, crumbly texture. Thinly scatter the seeds into rows 2030cm (8-12in) apart, setting them one inch deep. Once the seedlings pop up remove weaker specimens by nipping them off between finger and thumb at ground level or by pulling them out on a still day (to avoid the smell attracting carrot fly). Thinning can be completed in stages until individual plants are at least 5cm (2in) apart. It is worth digging around, so to speak, for the varieties of colourful carrots available. There are literally hundreds of different shades and shapes to try. A real gardeners’ favourite is the shockingly deep-coloured ‘Purple Haze’ whose purple outer reveals a rich, orange core when cut open. Eat it raw to appreciate the immense flavour these chunky roots have to offer. Contrast ‘Purple Haze’ with the almost glow-in-the-dark ‘Yellowstone’, whose smoothskinned roots are exceptionally sweet. Scarlet ‘Red Samurai’ from Japan hides a deep pink flesh, while ‘White Satin’ is a good option for its ghost-like roots. If you can’t find any of these varieties look out for others such as ‘Purple Dragon’, ‘Solar Yellow’, ‘Belgium White’ and ‘Atomic Red’ – the clue to the root colour lies in the name! Do rainbow car r ots taste dif ferent? White or golden carro cream colour. Thes ts are typically a yellow or e vegetables have a mild flavour with hardly any of the earthiness th at the other colours of carrots typi notably sweeter th cally contain. They are also an orange, red, an d purple carrots. All varieties of ca rrots and a great additio are extremely nutrient dense n to a healthy diet – they’re high in fibre and rich in potassium , vitamin C, and vitamin K. ... Red carrots are rich in lycopene (as are tomatoes – it’ s the phytonutrie nt that gives red fruits and veggie s colour) and beta -carotene.